SINGAPORE, April 30, 2018 /PRNewswire/ — Today, Principal Club Sponsor Standard Chartered Bank is launching King Kenny, a children’s book, to celebrate the life and legacy of Kenny Dalglish, the much-loved former Liverpool Football Club (LFC) player and manager. The Bank is also launching a short film to accompany the book. Kenny Dalglish is one of football’s all-time greats, and in recognition of his huge contribution to LFC, ‘King Kenny’ tells his legendary story, capturing valuable lessons from his inspiring journey in football and life. Kenny shows that being a true leader is all about paving the way for others. Emma Sheller, Global Head of Brand and Marketing at Standard Chartered, said, “We couldn’t mark LFC’s 125th birthday without celebrating the Number 7. Kenny Dalglish is a man who has inspired LFC and its fans across generations. His passion, experience and influence has reached the hearts of many, and we created this children’s book and short film to celebrate this legacy. Billy Hogan, Chief Commercial Officer and Managing Director at Liverpool Football Club, added, “Kenny is admired by LFC fans around the world for his unforgettable achievements with LFC as a prolific player, then manager, and his fantastic work with the local community. 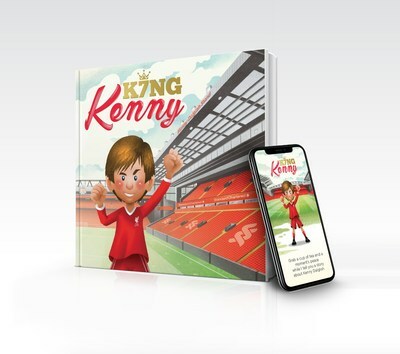 Conceptualised and created by global sports and entertainment agency Octagon, ‘King Kenny’ is written by children’s author Gavin McCormack. Gavin is also a school teacher and passionate LFC fan. Through this book, he hopes fans around the world will gain a new perspective on their favourite hero. ‘King Kenny’ is available online as a free interactive e-book at www.sc.com/lfc125/kingkenny. Fans can also download a PDF copy of the book in seven languages – English, Traditional and Simplified Chinese, Bahasa Melayu, Bahasa Indonesia, Vietnamese and Korean. A small number of fans will be lucky enough to secure a limited edition hard copy by participating in promotions run by Standard Chartered and LFC throughout the year. This book and accompanying short film form part of Standard Chartered’s season-long digital campaign that celebrates significant numbers in Liverpool FC’s history, during the Club’s 125th anniversary. Explore our insights and comment on our blog, BeyondBorders. Follow Standard Chartered on Twitter, LinkedIn and Facebook. As a socially responsible Club, Liverpool FC is proud of its heritage and plays a proactive role in its communities through its official charity, Liverpool FC Foundation. By delivering a range of award-winning programmes, the Foundation motivates and inspires children and adults, both at home and overseas, using football and the power of the Liverpool FC badge. Its contribution has been recognised by the award of a Community Mark from Business In The Community.